How Can Bankruptcy Help Me? You can eliminate your debt, put a stop to creditor harassment, and more. How you conduct yourself before bankruptcy can cause needless headaches. Discuss your debt relief options and a tailored strategy in your free consultation! Are you overwhelmed with debt? Are creditors calling you left and right, demanding payment? If you face foreclosure, wage garnishment, repossession, tax liens, or other debt problems, we invite you to take this opportunity to discuss your rights and options with a Worcester bankruptcy attorney. Our office is dedicated to helping people throughout Massachusetts stop those creditor calls and eliminate debt and stress. 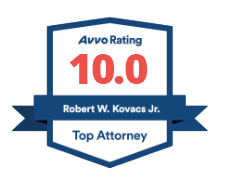 Our bankruptcy lawyer Robert W. Kovacs Jr. is top-rated by clients and peers alike, garnering a 9.8 Superb Avvo Rating due to his professionalism, dedication, and experience. We are ready with the client-centered approach and efficient, successfully support you deserve. We understand that filing for bankruptcy is never an easy decision to make, but we can fully review your situation to help you make the right choice. Once we have discussed the available solutions with you, we can help you follow the right course of action for your unique circumstances, helping you move forward to a stronger financial future as rapidly as possible. Contact our Worcester bankruptcy attorney for caring legal counsel on debt relief, bankruptcy, and foreclosure in Worcester, or the surrounding areas in Massachusetts. When Should I Consider Bankruptcy? If you are tired of dealing with harassing creditor calls and letters, and if you are worried about your family’s financial security, bankruptcy can give you the opportunity you need to get your financial affairs back in order. With a legal professional to help you avoid missteps and take full advantage of this debt relief, you may be able to quickly reach a fresh start and begin rebuilding your credit. If you are worried about what might happen to your assets in bankruptcy, fear not. Most people can keep their homes, cars, and all their assets after bankruptcy. If debt collectors are creating increasing stress for you, filing for bankruptcy can immediately put a stop to their harassment. What bankruptcy can do is help you eliminate your burden of debt and move forward to a brighter, stress-free financial future. How Can I Prevent Foreclosure On My Home? Can I Keep My Tax Refund When I File Bankruptcy? Law Office of Robert W. Kovacs, Jr.